The Phillie Phanatic makes an appearance during the Phillies-Tigers Spring Training game at Bright House Networks Field in Clearwater, Florida on March 11, 2007. The Phillie Phanatic is the official mascot of the Philadelphia Phillies Major League Baseball team. He is a large, furry, green bi-pedal creature with an extendable tongue. According to his official biography, the Phanatic is originally from the Galápagos Islands and is the Phillies' biggest fan. He performs various routines to entertain fans during baseball games at Citizens Bank Park and makes public relation and goodwill appearances for the Phillies. The Phanatic is usually acknowledged as one of the best ballpark mascots, and is arguably the most recognizable mascot in all of sports. During the winter after the 1977 season, Dennis Lehman, who thought that the team needed a mascot similar to San Diego's Famous Chicken, created the Phanatic with help from Harrison/Erickson of New York City (now known as Acme Mascots), which had ties with Jim Henson's Muppets, and the team's marketing and promotions department. Instead of a number on the back of his jersey, he wears a star. The character was named for the fanatical fans of the team. 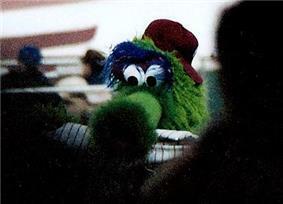 According to current owner and former team vice president Bill Giles, the Phanatic was created to attract more families to the Phillies' home, Veterans Stadium. The Phanatic replaced "Philadelphia Phil" and "Philadelphia Phillis", a pair of siblings dressed in 18th-century garb to invoke the city's revolutionary spirit from 1776. The pair were in the team logo from 1976 through 1978, and were part of the team's "Home Run Spectacular" at The Vet from 1971 through 1979. They reappeared with their replacement as the Phillies celebrated their final year at Veterans Stadium in 2003, including opening day and the final game. The Phanatic debuted on April 25, 1978, at The Vet, when the Phils played the Chicago Cubs. He was formally introduced to the public on the locally produced children's show "Captain Noah and His Magical Ark" by then-Phillies player Tim McCarver, who was doing promotional work for the team. In his book Pouring Six Beers at a Time, Giles wrote of the worst decision of his life when it came to the creation of the Phanatic. The design would cost $5,200 for both the costume and the copyright ownership, or $3,900 just for the costume with Harrison/Erickson retaining the copyright. Giles chose to just buy the costume. Five years later, when Giles and his group of investors bought the team from Ruly Carpenter, the franchise paid $250,000 to Harrison/Erickson for the copyright. The Phillie Phanatic dressed as Rocky Balboa during a game at Veterans Stadium on Opening Day, 1986. The Phanatic was originally portrayed by David Raymond, who was then working as an intern in the team's front office, for fifteen years, from 1978 to 1993. Raymond's father is retired Delaware Blue Hens Hall of Fame coach Harold "Tubby" Raymond. 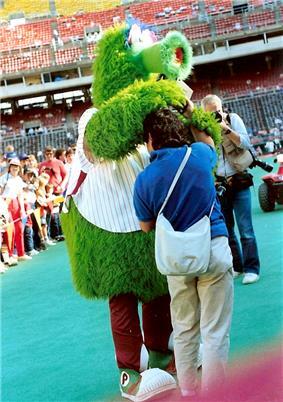 Since 1993, Tom Burgoyne has portrayed the Phanatic, although in public - in order to retain the illusion that the Phanatic is a real creature - Burgoyne maintains that he is only the Phanatic's "best friend." Taunting the visiting team by dancing provocatively in front of their dugout, mocking the actions of their players, and smashing or stomping on an object, such as a batting helmet, representing the team. Standing on the roof of the Phillies dugout between halves of the seventh inning for "The Phanatic Dance" and remaining on the dugout roof for the home half of the inning to "hex" the opposing pitcher. Warming up in the bullpen. Shooting hot dogs into the stands using a pneumatic gun attached to his ATV. Visiting the various broadcast booths and committing various pranks such as pouring popcorn on the broadcasters, spraying Silly String on them, or serving them Philly cheesesteaks. Buffing the heads of any bald fans who happen to be sitting near him in the stands. His mother, Phoebe Phanatic, occasionally appears on-field with the Phanatic. He also has a younger cousin Phred, who is rarely seen. The Phanatic's favorite umpire was the late Eric Gregg, a Philadelphia native, and he would greet him enthusiastically on the field when Gregg was in charge. Gregg would often play along with the Phanatic between innings, sometimes dancing with him or otherwise participating in his routines. One week before the Phillies had their 2006 opener, the Phanatic was "dyed" red as part of the team's week-long promotion to "Paint the Town Red". He was "dipped into a special paint" made by a team sponsor MAB Paints (now Sherwin-Williams) and changed from green to red. He returned to his regular color in time for the season opener for that year. This was repeated for the 2007 season, as he became red at a Philadelphia Fire Department station to help raise funds for smoke alarms in Philadelphia, raising over $4,000. "Paint the Town Red Week" has been repeated prior to the 2008, 2009, 2010, 2011, 2012 and 2013 seasons. There is a running gag where the Phanatic humorously mocks opposition players and they would steal his ATV keys in retaliation. 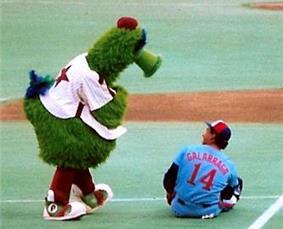 However, the Phanatic's antics are not always popular with opposition players and coaches. The Dodgers' Tommy Lasorda in particular did not like the Phanatic's mocking of the Dodgers. In 1988, he assaulted the Phillie Phanatic during a nationally televised game after the Phanatic stomped on a life-sized dummy wearing Lasorda's uniform (reportedly provided by Dodger infielder Steve Sax). The Phanatic also has the dubious distinction of being the most sued mascot in sports. In 2010, a woman filed suit claiming that the Phanatic injured her knee at a minor league game. The Phillie Phanatic with fans at Veterans Stadium at a Camera Day pre-game event in 1987. The Phillie Phanatic in the stands of Veterans Stadium on Opening Day, 1986. 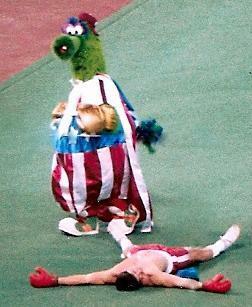 The Phanatic appeared in the closing credits of the film Rocky Balboa (2006). The Phanatic appeared on the episode of the television show Jon and Kate Plus 8 titled "Baseball Game with Daddy", where Jon took Cara and all 3 boys to a Phillies game. The Phanatic's head disappeared during the Phillies' "Final Pieces" charity sale and auction in 2004. Tom Burgoyne had taken off the costume for a break and found the head missing when he returned. One week later, someone anonymously called a local radio station claiming that he found the head and would bring it to the radio station. Police arrested and charged Bernard Bechtel with felony theft after he brought the $3,000 head to the station. In March 2009, the Phanatic appeared on The Simpsons in the episode Gone Maggie Gone, greeting a party of nuns disembarking from a ship at the future site of Philadelphia. In the Simpsons episode Dancin' Homer, there is a mascot that looks similar to the Phanatic, the Capital City Goofball. In November 2009, the Phanatic was part of a bit on the Late Show with David Letterman called "Get to Know the Phillie Phanatic." In 2010, the Phanatic appeared in the This is SportsCenter series of advertisements with Derek Jeter of the New York Yankees. The Phanatic was mimicked in an episode of "It's Always Sunny in Philadelphia" called "The World Series Defense." 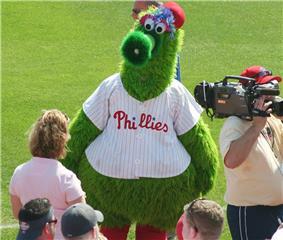 In the episode, Charlie's "Green Man" challenges that the "Phrenetic" (as it is referred to in the episode) should not be the only mascot for the Phillies. He is promptly put in his place by the "Phrenetic." In an interview with Angelo Cataldi, Tom Burgoyne revealed that Major League Baseball declined to allow the Phanatic to be used in the episode. Charlie references this at the conclusion of the episode, attempting to file a countersuit against Major League Baseball due to the fact that he has to call the mascot the "Phrenetic" when he knows its name is the "Phanatic". On January 26, 2012, the Phanatic (credited to Tom Burgoyne) appeared as itself on an episode of the NBC sitcom 30 Rock called "The Ballad of Kenneth Parcell". In 2015, the podcast 99% Invisible did an episode about the evolution of mascots focusing on the creation of the Phanatic. The phanatic was also on an episode of the show The Goldbergs in 2014 called "The Lost Boy", and made a cameo appearance on College GameDay when the ESPN show visited Philadelphia for a matchup between Temple and Notre Dame. The Phanatic was voted "best mascot ever" by Sports Illustrated for Kids. In January 2008, Forbes magazine named the Phanatic the best mascot in sports. In 2005, David Raymond founded the Mascot Hall of Fame, and the Phanatic was inducted as a charter member. Since 2003, Burgoyne has written several children's books, published by the team, featuring the Phanatic. In 2009, the Phanatic was one of several recipients of the Great Friend to Kids (GFTK) Awards, given by the Please Touch Museum (the Children's Museum of Philadelphia). The Phillie Phanatic, along with Youppi! and the San Diego Chicken, are the only mascots on display in the National Baseball Hall of Fame and Museum in Cooperstown, New York. In 2010, an assortment of 5 feet (1.5 m) tall, 100 pounds (45 kg) fiberglass statues were painted by artists and placed on display throughout Philadelphia from April through August with all monies raised going to Phillies' Charities. In 1989, Orlando's NBA expansion team, the Magic, was founded largely through the efforts of former Philadelphia 76ers General Manager Pat Williams. Williams introduced Stuff, a furry green dragon with similarities to the Phillie Phanatic, as the team's official mascot. When Williams staged the "birth" of Stuff at an Orlando event, the man inside the Stuff was Dave Raymond. The Hiroshima Toyo Carp mascot Slyly bears a resemblance to the Phanatic. Both characters were designed by Harrison/Erickson. ^ VanRipper, Tom (April 18, 2011). "America's Favorite Sports Mascots". Forbes.com LLC. Retrieved May 4, 2012. ^ "No One Needs to Tell Philly the Phanatic’s the Best". ^ Hill, Benjamin (August 12, 2008). "Mascot showdown: Phillie Phanatic vs. Parker". MLB Advanced Media, L.P. Retrieved June 19, 2015. ^ See List of Major League Baseball mascots#Philadelphia Phil and Philadelphia Phillis. ^ "Hatfield Hotdog Launcher Documentary". YouTube. www.youtube.com. Retrieved 2010-09-03. ^ "Youtube – The Phanatic jokes around in the Padres booth". September 11, 2013. ^ "Youtube – Corporan steals Phillie Phanatic's keys". August 7, 2014. ^ "Did Jayson Werth steal the Phillie Phanatic's car keys?". ^ "Video: Marlins' Miguel Olivo steals keys to Phanatic's ATV". ^ "I Hate the Phillie Phanatic". Tommy Lasorda's World. mlblogs.com. July 20, 2005. Retrieved 2010-09-03. ^ "Youtube — LAD@PHI: Lasorda has enough with the Philly Phanatic". November 2, 2013. ^ Roth, Tanya (July 2, 2010). "Phillie Phanatic Sued ... Again". Injured: The Findlaw Accident, Injury and Tort Law Blog. findlaw.com. Retrieved 2010-09-03. ^ Farr, Stephanie (June 30, 2010). "Big green litigation machine". Philadelphia Daily News (Philadelphia, Pennsylvania: www.philly.com). Retrieved 2010-09-03. ^ Kennedy, Rusty (February 14, 2004). "Phanatic's head back in place". ^ David Letterman (November 3, 2009). "Get To Know The Phillie Phanatic - Season 17 - Episode 3208" (Video). CBS.com. Retrieved 2011-02-03. ^ "Phillie Phanatic Stars in SportsCenter Commercial with Derek Jeter". Crossing Broad. www.crossingbroad.com. Retrieved 2010-10-11. ^ "La Mascotte". February 3, 2015. ^ "'"Please Touch Museum announces winners of the 14th annual 'Great Friend to Kids Awards. The Official Site of the Philadelphia Phillies. phillies.mlb.com. September 3, 2009. Retrieved 2010-09-03. ^ Phanatic Around Town" Summer Promotion""". VisitPhilly.com. Greater Philadelphia Tourism Marketing Corporation. Retrieved 2010-09-03. ^ Schmitz, Brian (April 17, 2009). "The Orlando Magic have many connections to the city of Philadelphia and their playoff foe 76ers". Orlando Sentinel. Retrieved 2010-10-11. ^ Ellsesser, Stephen (August 25, 2006). "Yakyu means baseball: Funny business". MLB.com. MLB Advanced Media, LPC. Retrieved 2010-10-11. Leddy, Scott Michael (May 20, 2010). "Phan Phavorites: 10 Most Beloved Phillies Role Players (including the Phanatic)". Philly.com (Bleacher Report: Philadelphia Edition). Philadelphia Media Holdings. Retrieved 2010-10-01. Brady, Erik (July 25, 2002). Call to Hall suits Phillie Phanatic just fine (about the donation of a Phanatic outfit to the Baseball Hall of Fame). USA Today. Retrieved 2010-10-07. How to make a Simple Phillie Phanatic Costume.